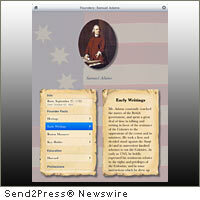 STANWOOD, Wash., June 20, 2011 (SEND2PRESS NEWSWIRE) — To commemorate 235 years of U.S. independence, EduServe, Inc. today announced the release of its new Spirit of ’76 application for the Apple iPhone, iPod touch and iPad. This exciting new app introduces the founding fathers to the digital age. “The Spirit of ’76 app provides a unique introduction to early American history and to the personalities who were present during this time via a platform that is portable and media-rich,” says Tim Newton, president and CEO of EduServe, Inc. Specifically, the Spirit of ’76 app is a collection of historical data surrounding the creation and signing of the Declaration of Independence. History teachers and students alike will benefit from the wealth of information that is self contained in the Spirit of ’76 app. They will discover a variety of biographical tidbits that relate to faith, careers, education, youth and the founding of the United States of America as documented in “The Lives of the Signers” by B. J. Lossing. Users will learn about the 56 signers as well as committee member, Robert R. Livingston, who while not a signer, helped to draft this historical document. They will also discover that George Washington was not a signer; he was not in congress at the time, but already fighting in the field for independence. Additionally, this app contains a collection of quotations and writings that reveal the thoughts and principles of these founders. It illuminates the overall setting that was present during this historical event. App users will also find descriptions of events and topics that span the eighteenth and early nineteenth century. Rounding out the app is a collection of books available from Amazon.com. This collection is designed to broaden the user’s familiarity with the men of this era and the drama they experienced during this time. This is the first iteration of this app; future enhancements will follow. The Spirit of ’76 app is available from the iTunes App Store for $0.99. For more information, visit: www.spiritof76app.com or check out Facebook at: www.facebook.com/spirit76app . Since 1991, EduServe, Inc., a leading consulting and software development company headquartered in Stanwood, Washington, has helped school districts to manage its student information system needs. Additionally, it has developed a variety of client-based solutions for data management and analysis. – Image caption: Founding Father and signer of the Declaration of Independence – Samuel Adams, in the Spirit of ’76 app. News issued by: EduServe, Inc. Original Keywords: CEO Tim Newton, EduServe Inc, iphone apps, iOS app, education, American History, Spirit of 76 app, biographical, faith, careers, education, youth and the founding of the United States of America, The Lives of the Signers by BJ Lossing, collection of historical data surrounding the creation and signing of the Declaration of Independence EduServe, Inc. Stanwood Washington State STANWOOD, Wash.
RSS News Feed for EduServe, Inc.
REFERENCES: Apple Mac and iOS News, CEO Tim Newton, EduServe Inc, iphone apps, iOS app, education, American History, Spirit of 76 app, biographical, faith, careers, education, youth and the founding of the United States of America, The Lives of the Signers by BJ Lossing, collection of historical data surrounding the creation and signing of the Declaration of Independence EduServe, Inc. Stanwood Washington State STANWOOD, Wash.